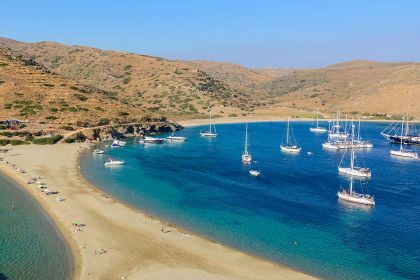 Call or contact your friendly Abberley charter broker here for assistance in planning an unforgettable yachting vacation in Kythnos and the Cyclades. 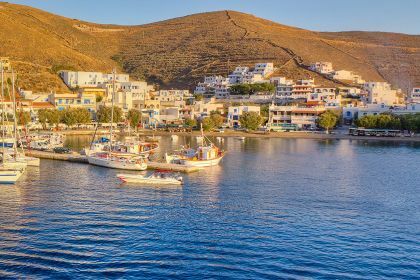 Situated in the western Cyclades between the islands of Kea and Serifos, this mountainous island has 100 kilometres of coastline and at least 70 beaches, many of which are only accessible by boat. 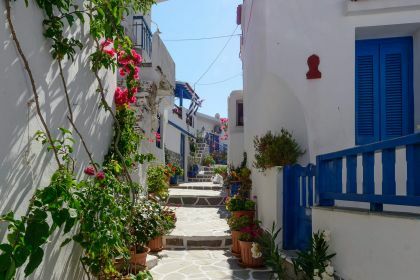 The two main settlements, Messaria and Dryopis, have winding streets too narrow for cars. The village of Loutra in the northeast is famous for its thermal springs, where visitors soak in marble tubs at the old bath house. Aboard your luxury yacht, the world – or, in this case, the island - is your oyster. Many of the beaches are only accessible by foot or boat, which allows you the pick of any deserted stretch. 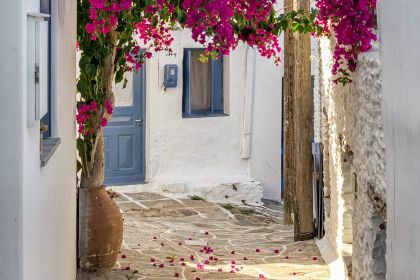 With its picturesque villages of traditional stone houses and paved streets, the island oozes history and tranquillity. Kolona Beach is unique in that it is essentially a strip of land connecting Kythnos to the islet of Agios Loukas. The result is a narrow stretch of strand with azure water lapping at both sides. The island’s main port, Merihas, is a great place to dock and has a vibrant nightlife and restaurant scene. For a quiet escape, Agios Dimitrios Beach on the southern tip is tranquil and seldom crowded. The beauty of being aboard a yacht is that, unlike other holidaymakers, you’re not tied to ferry timetables and can explore at your leisure. Take advantage of this and visit the hot springs off peak times when you may have the beach-side natural Jacuzzis all to yourself. With 32 top dive sites – including a shipwreck dating back to World War II – Kythnos is an underwater paradise filled with exuberant aquatic life including moray eels, red mullet and rays. Local cheese, meats and fresh seafood are the order of the day on Kythnos, where traditional Greek cuisine often gets a contemporary twist. With its friendly ambience and farm-fresh ingredients (the owners grow much of their own produce), Archipelagos serves up hearty meals including lobster spaghetti, freshly caught fish and delicious dips and starters. Popular with yachters, Ostria, in the delightful village of Merihas, is renowned for its incredible seafood and fish. You don’t want to leave the island without trying hima krasi (local wine) or tsipuro (a digestive aperitif), which go down well with traditional Kythnian fare. The waterfronts at Merihas and Loutra have a good selection of laid-back bars, as does the capital. For something more energetic, beach club and bar Akrotiri regularly hosts DJs and patrons dance until the wee hours. In Loutra, Poco Loco Bar – conveniently situated right on the marine – is a relaxed spot for a drink. Ready to dive into idyllic Kythnos? Contact our charter broker, give us a call or leave a message in the form below. Insider tip: There are many religious festivals on the island throughout summer, where you can witness traditional music, food, dancing and costumes.